You are directly facing the sea in this apartment located in a small group of 5 apartments in Saint-Pierre-Quiberon. The 37 square meters offer enough space for a family or a small group of friends. Pets are not allowed in the apartment. Private parking is available. 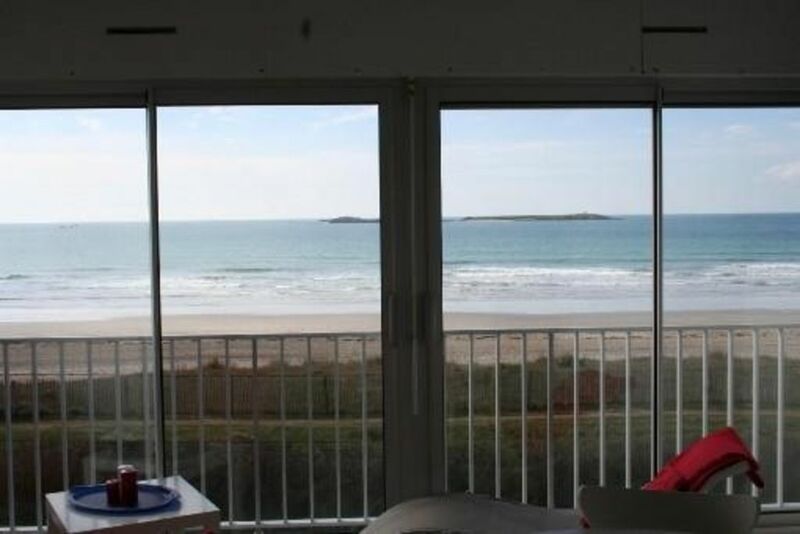 You have a great view of the beach and sea. The kitchen is functional and has a hob, a microwave and a refrigerator. For nightlife, a TV, stereo and DVD player are available. You can come to any season in this apartment in the privileged position. Take walks on the beach and enjoy the benefits of the sea air. In summer, you just get out of the apartment to go swimming, sailing. Appartement très agréable et très au calme. La vue est juste incroyable et l'appartement est joliment meublé. La description est conforme. La voiture est indispensable et les vélos sont recommandés. Le coin est magnifique. Nous avons passé 2 semaines parfaites. La plage devant l'appartement est un spot de Kyte / Planche et Char à voile : Spectacle assuré mais vent ...mais les plages abritées ne sont pas loin. Explore the coastline of the Wild Quiberon peninsula and impressive landscapes. Visit the fishing village of Portivy, alignments Kerbourgnec and the grave of the Pointe-de-Guéritte. The famous Carnac Stones are also close to the apartment. Going there, stop in Plouharnel order to see all of megalithic monuments.